The day I’d been looking forward to and dreading in equal measure had finally arrived: the launch of my very first book, Sorrowline. I’ve done my fair share of public speaking before – mostly as part of my day job as an animation director and producer – but this was different, this was my book! 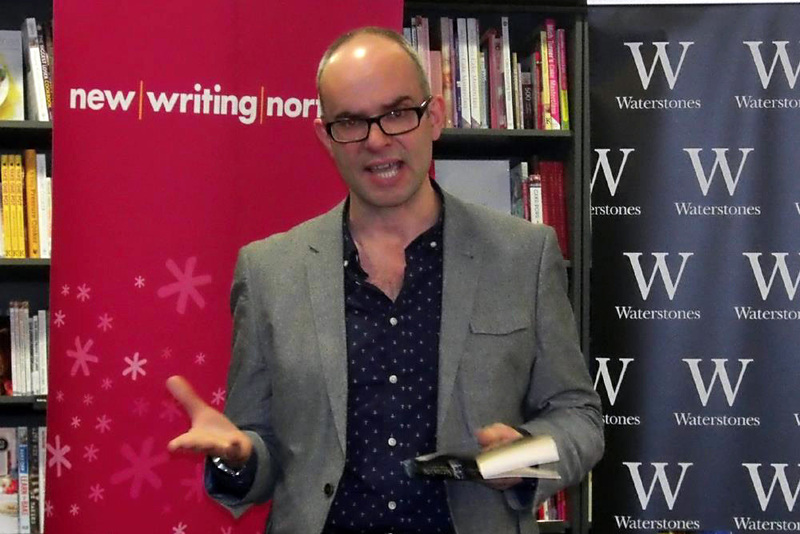 This was going to be a public reading of something very personal, and I had no one else to fall back on or blame! Animation is a team effort, a collaboration with lots of creative people who come together to produce the finished article. Every author has his team too: agent, editor, publisher, family. But for the most part it’s a lonely path to publication. 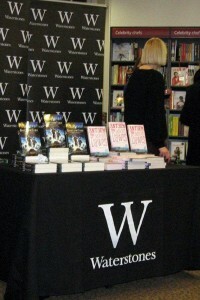 So as I arrived at Waterstones I felt like a singer who had dumped his band and gone solo. But I was hardly alone: I had lots of support on the night. Not only had my wife, children and parents come along, but my agent, Juliet Mushens had made the long trip up into the wilds of the North for the evening, bringing with her a heavy does of cold. Eve Warlow, Andersen’s publicist, also came up from London to cheer me on. And as the room filled up I saw many familiar faces: old friends, work mates, and a healthy peppering of regional authors. 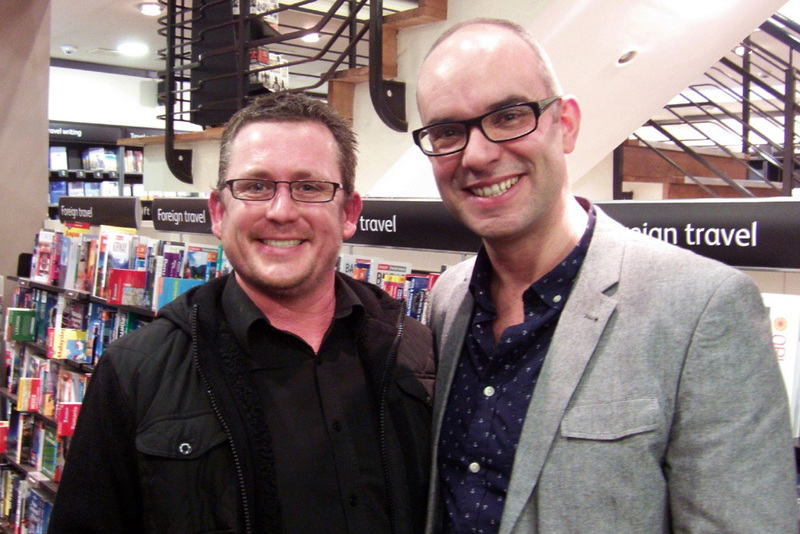 New Writing North have encouraged so many of us along the way to publication that we’ve become a sort of unofficial gang, who often appear at each others events. Honestly, it’s great to see such warm support. So you can imagine, with so many people there who knew me, the stakes were high. I really didn’t want to fluff this! 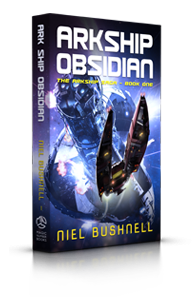 Colin Mulhern is an old friend who happens to have two books of his own on the shelves of Waterstones. 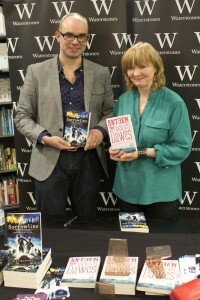 Authors Dan Smith and Mari Hannah also turned up to show their support. 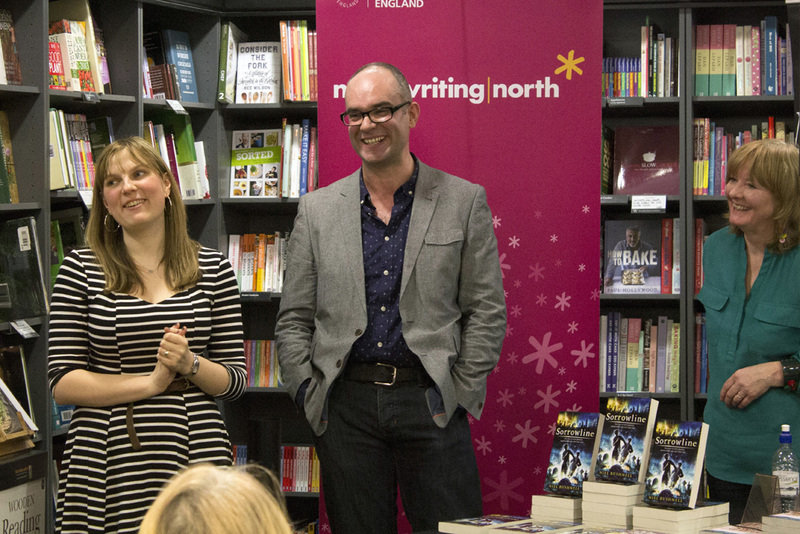 The event was a shared launch with fellow Northern Writers Awards alumni, Celia Bryce launching her teen novel, Anthem for Jackson Dawes (Bloomsbury, 2013). Celia had her own supporters there too, so the room was packed! Emergency chairs were hastily summoned out of storage! Me and Celia Bryce show off our books. 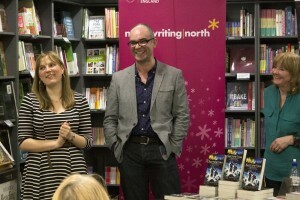 The event was hosted by Rebecca Wilkie, Programme Manager for New Writing North, and Celia and I took it in turns to read an extract from our books, and answer questions. I’m relieved to say that in spite of my nerves I think I did OK. 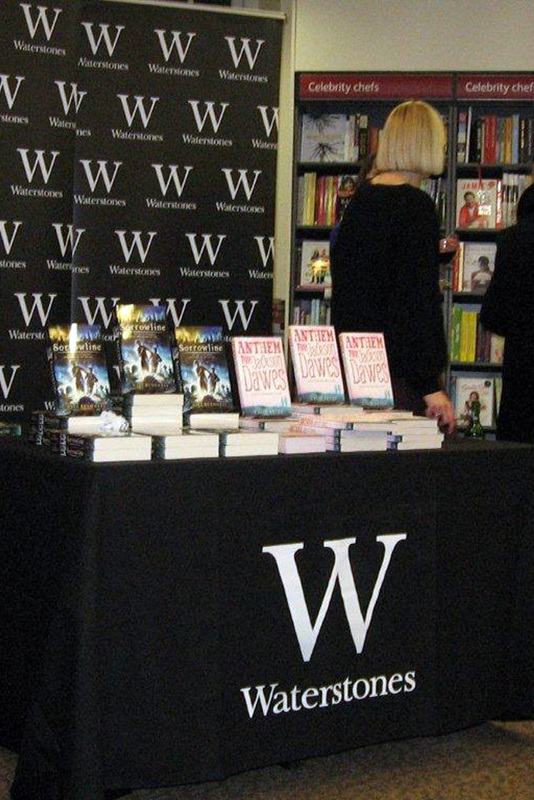 It all went over so quickly, and I can barely remember what I babbled on about, but no one heckled or left. Keep talking, Niel. It’ll all be over soon enough! The readings are over, and the relief is evident! 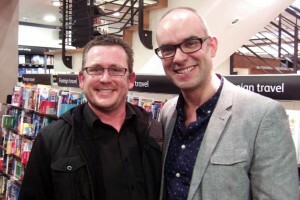 The best part of the night was meeting so many people afterwards wanting to buy my book and have it signed. My signature is a scrawl to behold, and I’m certain it devalues any copy immediately, but it didn’t stop people wanting me to scribble inside their copies. Then, in a whirl of chatter, it was over! We decamped to a nearby pub for a much needed pint or three where I refused to allow my poorly agent to leave for the early night she needed! I was in giddy party mode and no amount of sick friends was going to stop me! 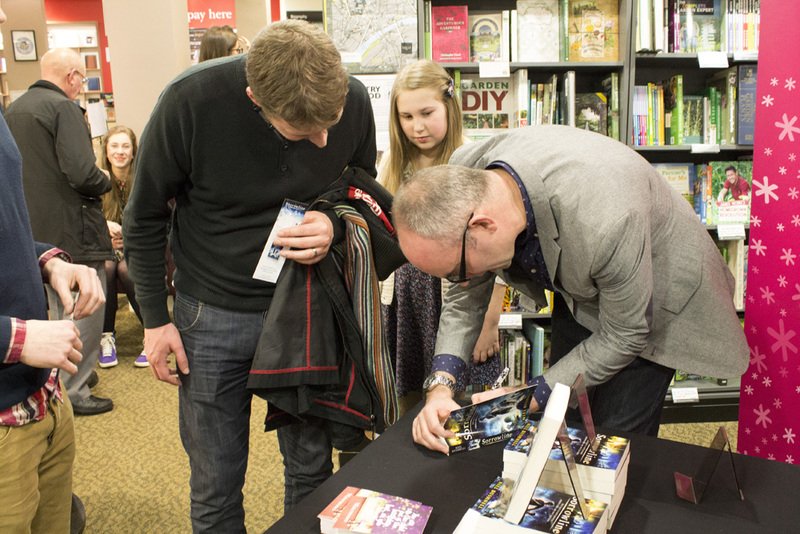 Signing books is tricky when you’re left-handed! 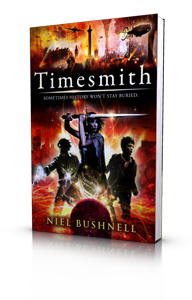 I have to say a massive thank you to the friendly staff at Waterstones Newcastle, and to New Writing North and Andersen Press for pulling it all together. 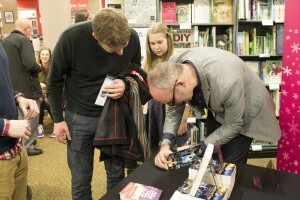 Also thanks to Chris Chatterton for taking most of these pictures. You can see some more on my Facebook page here. (Click the Like button to get future updates.) 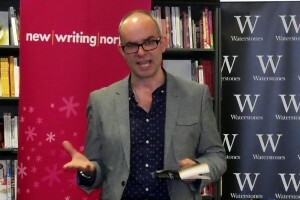 And for some other views on the event take a look at these two blogs: Robyn’s Nest: Tea with an author and Colin Mulhern: Double Whammy.